As an amateur chess player, I find it fun to look for opportunities to play some chess when travelling. I am not a very good player, but have played for fun since 2011. I play at a local chess club in Trondheim, try to attend every week, but that does not always happen. I have no ambitions of becoming an expert on the game, but have found playing chess while travelling is a fun way of getting contact with people. If I meet another chess player we can always play a game together. 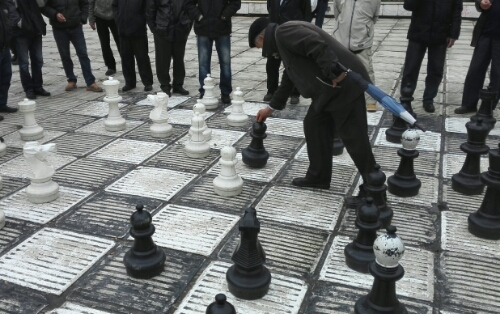 My chess journey started in Sarajevo, Bosnia, where every day a group of locals gather to pkay chess for hours. I was visiting Sarajevo for a few days and could not let the opportunity pass me by. I wanted to play a game with them. While travelling Japan during the summer of 2015, my friend and I found a chess club in Osaka where we played some games. I found the chess club in Japan to be very different to my chess club back in Norway. Feeling a bit down and disappointed after two losses in Osaka, it was nice to finally score a win when I played a game at a bar in Okayama. In the fall of 2015 I participated in a chess tournament in Trondheim, my first in many months. I had no expectations, but ended up not doing too badly. While visiting Iceland in 2016 I got the chance to vosit the great chess player Bobby Fischer’s grave as well as a museum dedicated to him. That inspired several blog posts. These are my chess travel stories so far. There will be more stories published as I play more chess on my travels.